ELLENTON, Fla., (October 4, 2017) - Feld Entertainment® announced today the 2018 AMSOIL Arenacross schedule, which will consist of 12 rounds in the battle for the coveted Ricky Carmichael Cup. The most intense indoor professional motorcycle racing kicks off Saturday, January 6 in Dayton, Ohio. 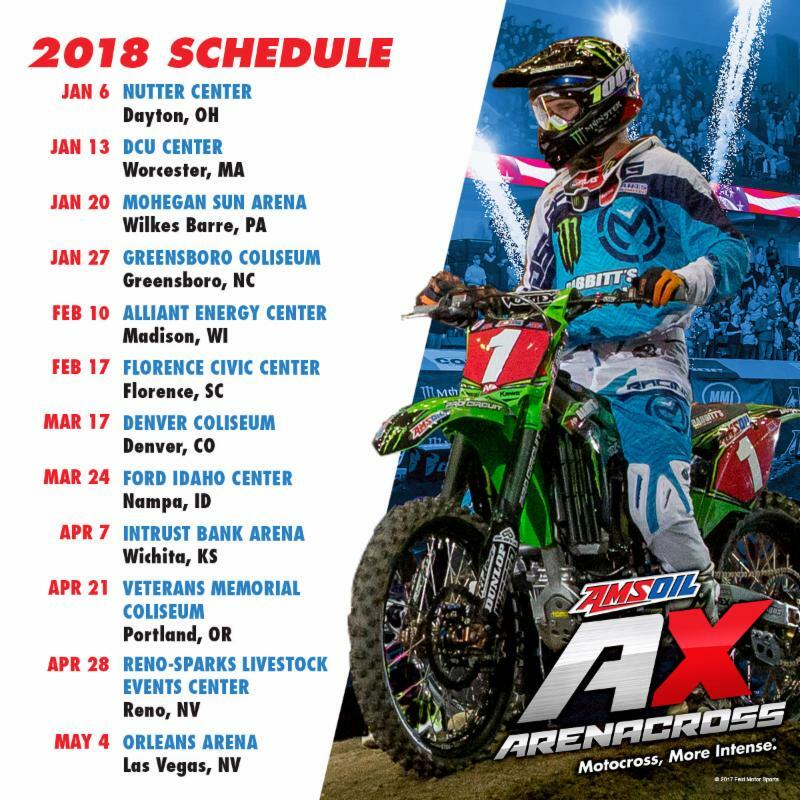 The 2018 AMSOIL Arenacross season features top professional athletes competing on man-made, custom-designed tracks built inside the country''s most well-known arenas. The tour will travel to 11 states in 2018 and kicks off at the Nutter Center in Ohio after a five-year hiatus. The series will make a first-time stop in Florence, S.C. and will return to Las Vegas to crown a champion on May 4. "There is a lot of anticipation leading into the 2018 season with the newly-added markets and venues for more fans to witness the bar-to-bar racing action. The competition in AMSOIL Arenacross has never been more intense and we are expecting a season packed with surprises following last year''s hotly-contested championship," said Sr. Director of Two-Wheel Operations, Feld Entertainment, Inc., Dave Prater. "The sport of AMSOIL Arenacross is constantly growing in live and broadcast audiences, and we are excited to keep evolving as well, making it better for our athletes and fans alike." While Saturday is all about the pros, Sunday also features another full day of racing as AMSOIL Arenacross provides the sport''s only developmental platform for amateur racing. Fans can expect to see hundreds of the fastest amateur athletes testing their skills across 27 classes on the same arena-sized tracks as the professionals. The 2017 AMSOIL Arenacross season saw double-digit audience growth across its digital platforms, with Instagram showing the highest increase at 46 percent followed by Facebook at 24 year over year. This double-digit momentum is expected to continue as fans will be able to tune into AMSOIL Arenacross on FS1 for the fifth straight year. AMSOIL Arenacross provides a fully-engaging environment for fans with an exclusive pre-race Track Party and adrenaline-filled opening ceremonies for 12 nights of fierce, high-flying racing competition. Reigning two-time AMSOIL Arenacross champion Gavin Faith will compete in 2018 alongside the sport''s unwavering two-wheeled professionals over obstacles sculpted from 3,000 tons of dirt brought in for each race that sends racers flying up to 30 feet in the air. Tickets for the 2018 AMSOIL Arenacross season go on sale Tuesday, October 24, 2017.